Katie chose the PERFECT time of year to have her Luxe senior portrait session; mid October can have some of the best weather and all the leaves have started changing. Not to mention that sun sets a bit earlier giving us the perfect timing to get the most amazing golden sunlit images for the grand finale. After hair and makeup at Zen Salon and Spa by Frankie we started out with some subtle Iowa Hawkeye vibes. After that we got a little more edgy with a off-the-shoulder top, army green pants and heels. We ventured down a grungy ally and found some bright red chairs downtown Iowa City. Sometimes less is more, so we looked for a simple urban spot to go with her all black outfit with pink heels. Next we wanted to look for a more modern location to go with her romper and cardigan outfit so we headed to a new hotel close to downtown. Since the Luxe session comes with 6 outfits that means we drive to a few different areas of town to achieve a variety of looks and feels for each outfit. And of course I had to take Katie to a parking garage. They are my favorite places to photograph and the blue tones compliment each other perfectly! And lastly we ended up in a field of super tall grass and trees while the sun was going down casting a beautiful golden light on the whole area. We saved Katie’s favorite outfit for this spot and it was EPIC! 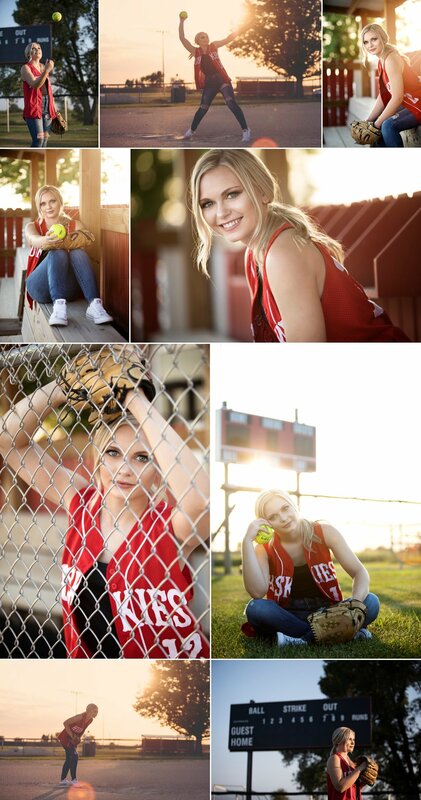 Katie - Thanks for an amazing senior session. You killed it and got some truly beautiful images. I can’t wait to see where you go in life. Good luck and congrats on graduation! 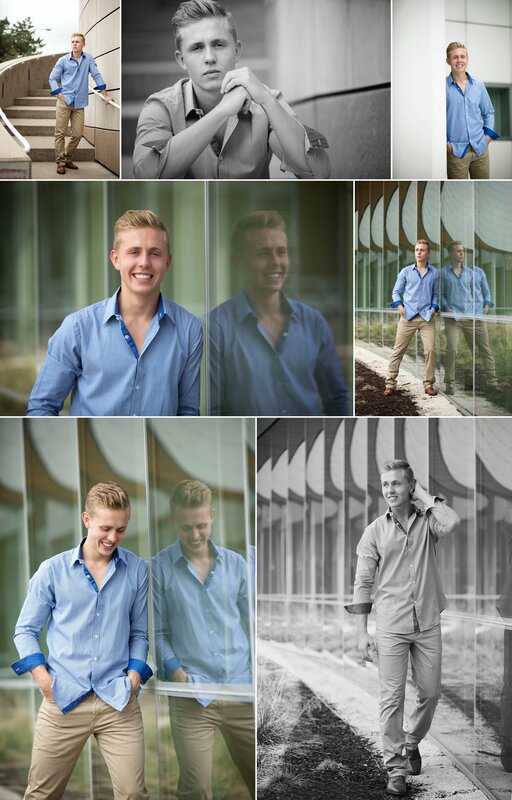 Amazing senior portraits aren’t just for girls! I photograph just as many guys as I do girls and love finding just the right locations to fit their personalities. Tommy has such great taste, we had a blast getting him the styled look he was after. Not only did he get killer images but read to the end of this post and see some of the products he got too! First outfit was more formal so we started out at the U of I School of Music’s Voxman Building. Tommy is a performance artist, so what better place? If you’ve been following me for a while you know that I can’t get enough parking garages in my life. Tommy’s next casual outfit was perfect for just such a place! To add variety we looked for a location with a little more color. The sun was out so we just had to feature some great shades with outfit #3. Lastly Tommy wore a classic black sweater and grabbed a jacket to add part way through. Tommy and his mom chose some great products to display in their home. 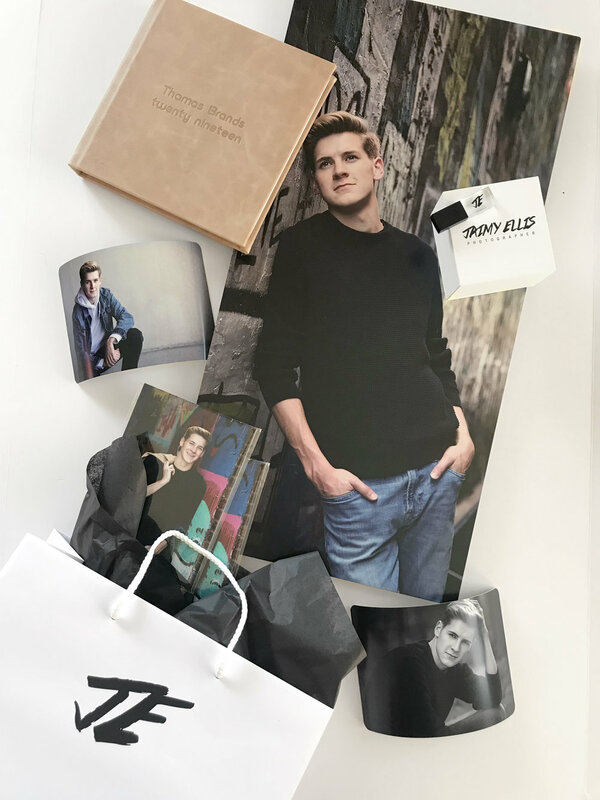 Pictured is a 12x24 metal wall art piece, two 5x7 gift prints, a couple 5x7 curved metal prints, a Signature Album with distressed leather cover and a USB containing all the full res files from his session! THANK YOU for a great session Tommy! Good luck with all you do and CONGRATS on your upcoming graduation! Class of 2020, it’s not too early to get your custom senior experience started! Contact me TODAY for a list of available dates. Spots are limited and sell out fast. 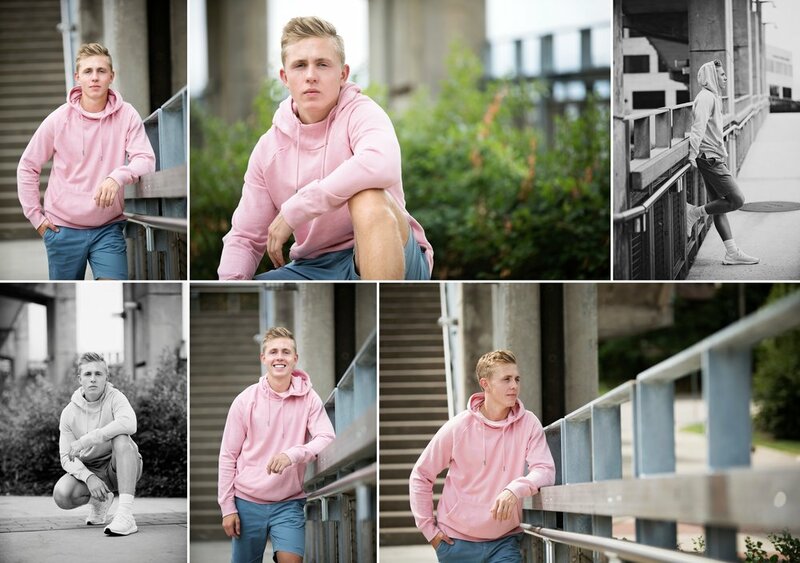 When I met with Carson and his mom to plan his senior portrait session I was immediately excited to put together an experience that completely matched his style. Each of his outfits were totally unique to one another and I had a blast partnering them with locations to finish the look. We started out with his most formal look at Hancher Auditorium. Next we found a more stadium-esque location for a more athletic vibe with his hoodie and shorts. After that we ventured to the downtown Iowa City area for a couple outfits. 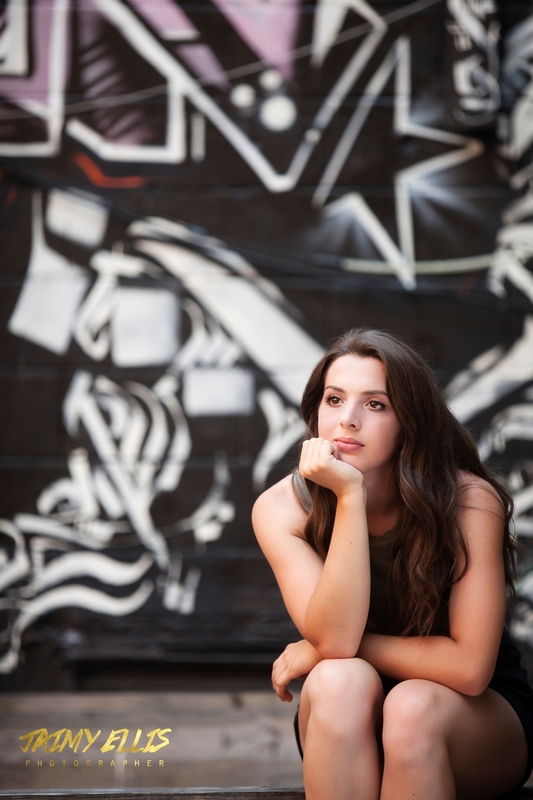 I like to take seniors downtown bc there are so many location options that add variety to the session. For a cool urban location I chose to match his black T and jeans with concrete and an underground parking garage entrance. 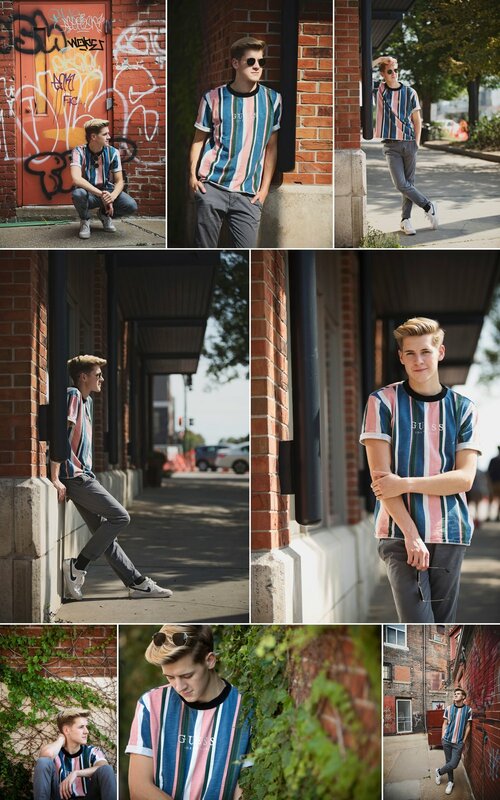 After that we had to find some sunshine for Carson’s shades…so we ventured to a diff spot downtown with bricks and ivy. 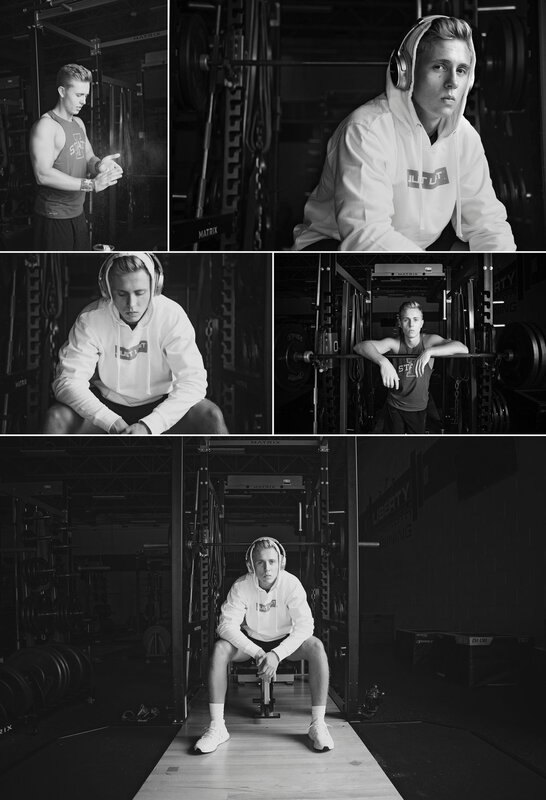 Fitness is a huge part of Carson’s life and something he is very passionate about. So we just HAD to get his weight lifting gear and head to a gym. We were able to get into the Liberty High School brand new weight room and it did not disappoint. I even found awesome window light! 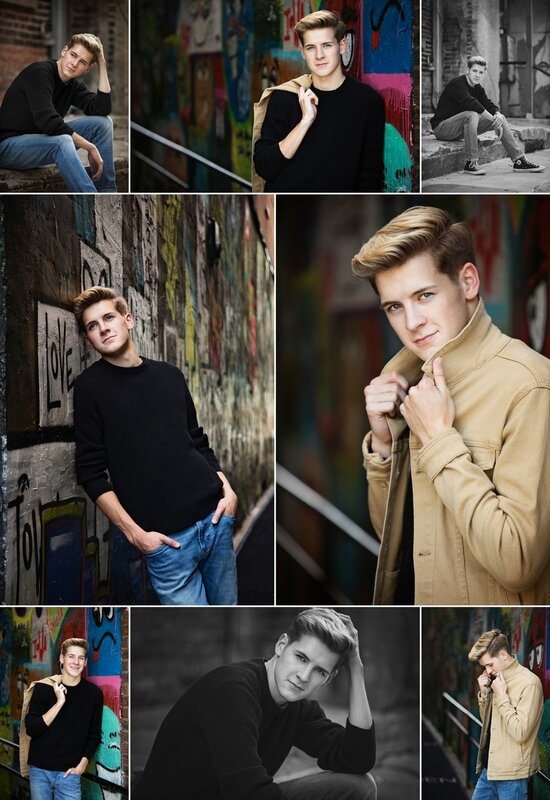 Thanks Carson, for an amazing session and having awesome style! 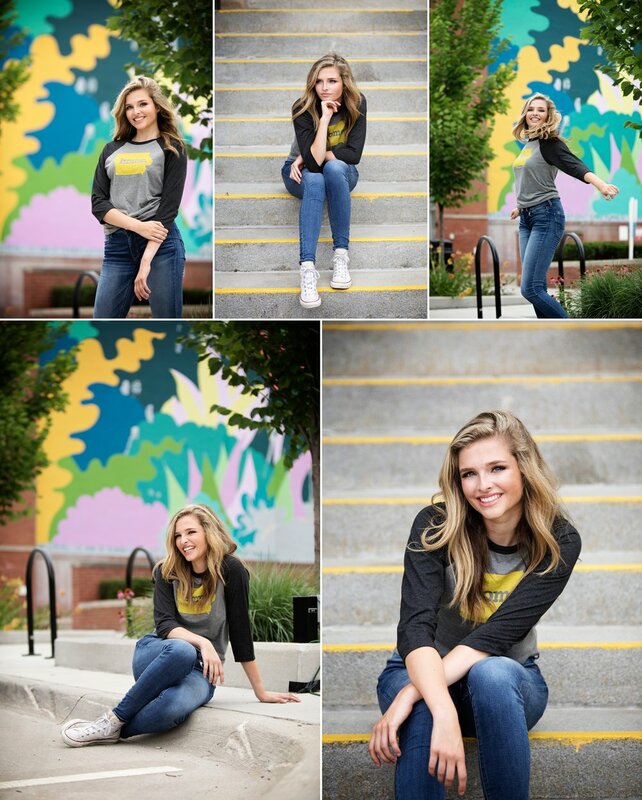 From start to finish Megan's session was a so fun! We met at Zen Salon and Spa where Frankie did her hair and makeup then we ventured into the back allies of downtown Iowa City. Her first outfit was this edgy red crop top with jeans and a leather jacket. Perfect fit for murals, graffiti and metal stairs. Personally, one of my all time favorite things is camo. Camo anything. So I was super excited to see Megan's camo dress outfit with jean jacket. I paired this look with another of my favorite things...a parking garage. If you've been following me a while you know that I shoot in parking garages all the time. I always find creative ways to photograph and interesting light patterns. Plus Iowa City has so many great parking ramps to choose from! For the next two outfits we went to the art building area of the U of I campus where we found two completely different looks right next door to each other! And now for something completely different. Megan wanted a well rounded session from urban to country so we hoped on the road to her next two looks. First stop...Highland HS softball field. By this time the sun was starting to set and the light was just dreamy! For the grand finale we grabbed a hat and moved into the classic Iowa prairie grass during golden hour. What better way to end a session? The most commonly asked question by seniors (and parents) after booking their senior portrait session is "What should I wear?". Well that is an easy answer, wear your all time favorite cloths! Picking outfits for your session is one of the best parts of your senior portrait experience, and with a little help, is easy too. Don't stress! Not only will you get a What to Wear Guide in your welcome packet to give you ideas and places to shop, but I can even help you put together the perfect looks during your in-home styling consult. The key to picking outfits for a well rounded session is variety. Choose looks ranging from formal to super casual including different types of tops and bottoms. Don't forget to accessorize. Hats, jackets and scarves can switch up the whole look without having to change cloths, like two outfits in one! Emma's session is a good example of outfit variety. She chose to start out with a classic little black dress paired with the cutest pale blue heels to put her own twist on the look. Emma's next outfit was perfect for a more funky location. Trendy and fun, this crop top and mini skirt went perfectly with the ally way graffiti for a more urban yet casual look. Everyone has a favorite pair of jeans, right? Emma wore hers with a chunky sweater for that laid-back look. And finally we ventured just outside of town and into some prairie to show off her love for Iowa. Most casual outfit yet; Iowa tee, oversized cardi and shorts. I am so thankful that Kenya's mom showed me a brand new location right in the middle of Iowa City. It has the coolest rocks and went perfect with her green jacket! I just love the accessories this time of year. Kenya had great jackets and scarves. The weather was beautiful! Kenya told me during her photo shoot that she aspires to be a pharmacist. I can't wait to find out what kind of adventures she will go through reaching those dreams. For the last outfit we found an old basketball hoop to focus on her love of basketball instilled in her by her dad. thank you Kenya for a fun photo shoot! I'm so glad to have enjoyed a beautiful day outside with you and your mom. Good Luck with your senior basketball season! Elaina loves nature and being outside and it was important to have that represented in her senior photo shoot. We started out at a rustic bridge surrounded by the changing leaves. Perfect for her casual and laid back style! The second spot brings out the yellow in her dress. I love the stone and yellow leaves we found at this spot. You would never guess we were right next to a busy highway! The Ivy in the third spot couldn't have been more perfect. I love how Elaina's skin pops against the colors...and those eyes! Anna is one of the first to be photographed this senior season and I am so excited to show some sneak peeks of her amazing photo shoot! I knew her session would be awesome when we met for her styling consult and saw the outfit choices she had made. We had such a great time exploring downtown Iowa City finding the prefect locations for her wardrobe. For her first outfit I chose one of my favorite places to photograph...a parking ramp. The neutral tones and clean lines matched her grey top and made her jewelry pop! I can always find interesting light patterns on sunny days near a parking ramp. Anna rocked a sweater despite the upper 90 degree weather, and wore a super cute romper for her last look. I paired it with some greenery while staying true to the urban style she wanted to achieve for her senior portrait experience. 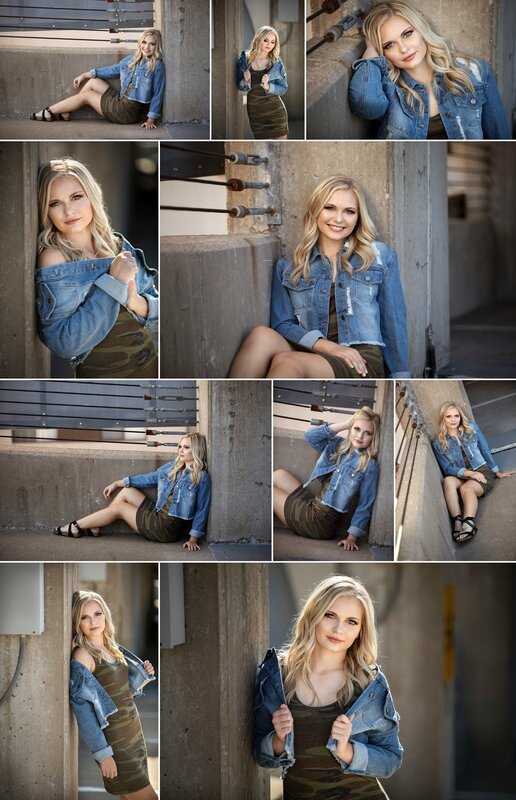 Thank You Anna for a crazy fun senior photo shoot, I can't wait for you to see the rest of your images!